The 2017 Series Enders Reading Challenge was another success, and so Holly and I decided we're in this for yet another year. Welcome to our 5th Annual Series Enders Reading Challenge. While the rules this year are essentially the same as last year, we did tweak the wording on a few and add some clarification so please be sure to check them out for a refresher. This challenge will run from January 1, 2018 until December 31, 2018. Monthly giveaway prizes will be an e-gift card of your choice up to $5 (USD) from Amazon.com or BarnesandNoble.com. While the challenge and giveaways are open internationally, please make sure that you can receive e-gift cards via Amazon.com or BarnesandNoble.com. We want to make sure everyone has an equal opportunity to participate and to receive the prizes. Please remember that Holly and I are funding the giveaways out of our own pockets as something that we want to do, and we would like to continue to do so. Please make sure we have a valid email address or other means of contacting you if you choose to participate. Linking up to Goodreads is perfectly fine, but we have found that Goodreads is not a reliable source for contacting someone should you be selected as one of the monthly giveaway winners. This could be due to your Goodreads notification settings or Goodreads themselves could be at fault. We're not sure which. And since we want to make sure that everyone who is eligible for one of the giveaways will receive their prize should they win one month or the grand prize at the end of the year, it is up to you to ensure that we can contact you and that you respond within a reasonable amount of time (usually stated in the email notifying you of your winning). Write a blog post about joining the 2018 Series Enders Reading Challenge on your blog. For those of you who would like to participate but don’t have a blog, post about it on Facebook or Twitter. And that’s it! 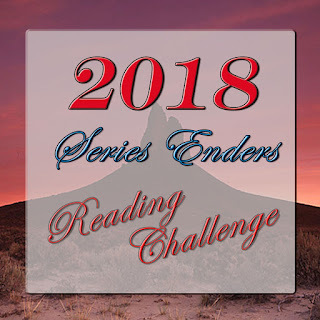 Welcome to the 2018 Series Enders Reading Challenge. Good luck! I am in the middle of so many less series since you have started this challenge. It really does help me to get those series enders done. Thank you for hosting for another year.